Shortly after September 11, the United States went to war; first in Afghanistan and then in Iraq. Within a year, boots began to be displayed in public parks with the names of the lost. I could appreciate the displays because we should always be reminded of that cost and the price paid for our freedom. When the mantel of responsibility was passed to the new occupant of 1600 Pennsylvania Avenue, the boots suddenly disappeared. What had changed? We were still fighting. Our men and women were still dying but the boots were nowhere to be found. From 2001 to present 5,795 sets of boots would be needed if those boots were to reappear in a park. From those boots I knew three. Of the two hundred and ninety-four sets of boot that would be required to repeat this exhibit for Desert Storm, I knew two of those boots. Today, it has become self-evident that many Americans no longer understand the price paid for the ability to question if our flag and our National Anthem can be offensive to some and why others can’t understand that. Well, here is my response. The American Civil War, fought from 1861 to 1865, was our most costly conflict, requiring over 750,000 sets of boots to display for all those who surrendered their lives to bring conclusion to slavery. Every aspect of the mosaic of the American experience – black, white, rich, poor, men, and women filled those boots and died for the belief that the American Cause was worthy of that sacrifice. 58,479 boots would be needed for Vietnam. At least their memorial can accurately name each and every American lost. The World War Two memorial has a single star for every one thousand names with over four hundred stars, which would require over 400,000 boots. 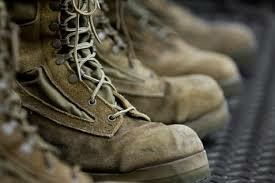 If you were to display a set of boots for all the wars since the birth of our nation, the total would be only 1,354,664. To better understand the price of service I will use President Bill Clinton, our last “peace time” president. The Department of Defense reports during his presidency, on average, 2,200 American service personnel lost their lives each year due to training accidents. 17,600 pairs of boots would be required for all the Americans lost during the eight years of his presidency. The presidency of Bill Clinton is not an isolated era. 2,200 is the average number of Americans lost in the military per year for all presidents from Jimmy Carter to George W. Bush. When I first saw this statistic, it was the sixth year of George W. Bush’s presidency. For me, it was a sobering moment when I realized more Americans died in training at that moment in the Bush presidency than in war, and that was not accounting for all the service personnel seriously wounded in service in war or training. At that moment I understood the red in the American Flag that represents the blood sacrificed in the defense of our nation was not red enough. I do not believe there is a single American veteran that does not know the name of at least one set of boots that surrendered their lives for the ability of Americans today to question if our flag and national anthem are offensive or is a correct venue for political posturing. Although, I remind myself that I served for my fellow Americans to do things I despise, does not mean you should do it. For many veterans the flag and the national anthem are very personal. Too many of our friends came home with it draping their coffin. Twenty-Four Americans I knew came home that way. Five died in war and nineteen in training accidents. To their families there is no difference. In the following four articles (April to July), I will share the stories and names of some of these boots. Stories that moved me as a student of history, of men and women who served at a moment in American history where our nation was not all it should be and yet they choose to serve and sacrifice and were proud of our flag and national anthem. Just as the mosaic of American society knows all colors, creeds, and religions, the mosaic of military service and sacrifice also includes all of the best of humanity and excludes no special interest. In fact at a time where conscription was law for some, many ethnic groups volunteered to serve and die when they did not have to. Of the seventy-nine wars and military conflicts from 1775 to present there is not a single one where a woman or minority has not served and sacrificed. We stand to remember and honor the millions of Americans who sacrificed and died in service to our nation. These men, women and children of all colors, religions, sexual orientations, and national heritages, who in many cases did not have to go but went anyway, only to return home shattered by their service or not at all. We stand for them. If we Americans cannot come together for the three minutes and thirty seconds it takes to sing the, “Star Spangled Banner,” our national anthem, to remember all that was sacrificed, then we are lost! Previous Post: To Revise Or Not To Revise, That Is The question?